Home » Uncategorized » How about lunch with President Obama at the SFJAZZ Center on 11/25/13? 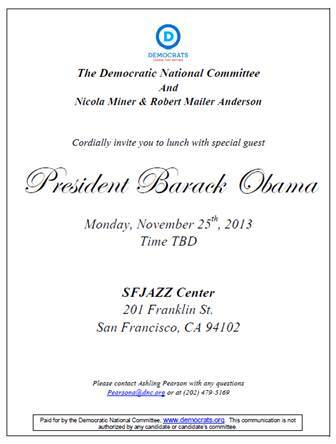 How about lunch with President Obama at the SFJAZZ Center on 11/25/13? Please join me in welcoming our 44th President of the United States, Barack H. Obama, to the Bay Area once again. This fundraiser will assist the Democratic National Committee prepare for the 2014 and 2016 elections. Recently they just announced special musical performances by Jazz Legends Herbie Hancock and Esperanza Spalding. I hope to see you on Monday, November 25, 2013 at the SFJazz Center. By KLN Consulting Group in Uncategorized on November 1, 2013 .